Horizontal and vertical movements of the work piece are made in Cast Iron. There is a good quality Bearing Housing that houses one end of the Rotating shaft, Step Pulleys and Belt. 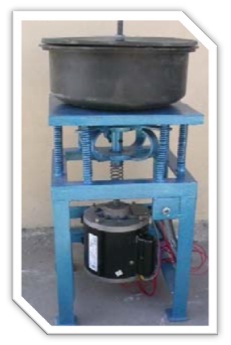 1440 rpm, 220 volts-single-phase AC-50 cycle comes with the machine. The Leads and connections are provided for the motor. 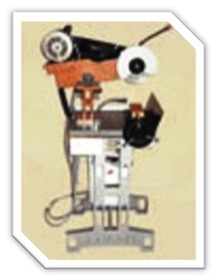 One Clamping Vice for clamping or gluing the stones is provided. The machine is supplied with one set of steel washers to support the cutting blades. Rough Stones are held or glued in the clamping vice and the vice is set horizontally at the place where cutting is desired. Then the motor and the coolant pumps are started and the blade is brought down slowly on the stone. Once the complete cut is obtained, the blade is left free to take back its original place. The stone is either removed if only one cut was required or the clamping slide is moved horizontally with the help of the moving wheel to another desired position to perform another cut. This is an ideal machine for sawing large slabs of rough stone. The machine can also be used for sawing tiles of large slabs.